Every month, or so, we will be sending you our “Things We Love” newsletter. Perhaps it will contain photos from a recent adventure, an image of a unique culinary presentation, or one our most recent Designs. Whatever it may be, we very simply love, and are inspired by, the amazing world we live in and would like to celebrate this with you! I couldn’t think of a more appropriate subject to kick-off our first issue of “Things We Love” than the person I love most in this world, my daughter Lola Sophia. Lola is eleven years old and resides with her Mother in Marseille, France. As I live in Bangkok, Thailand we physically see each other every 2-3 three months, but these are the times in my life that I cherish the most. A few months back I met Lola in Marseille and we popped over to Barcelona for several days of great Architecture, Design, hot cocoa, seafood paella, and the list goes on and on. 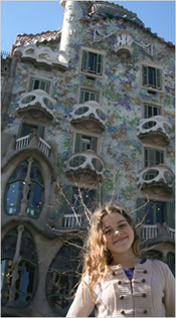 I’ve included here a photo of my beloved Lola in front of Gaudi’s Casa Battlo. We Love the way in which Gaudi successfully integrated boldly organic forms with innovative function in his architecture!!!!! 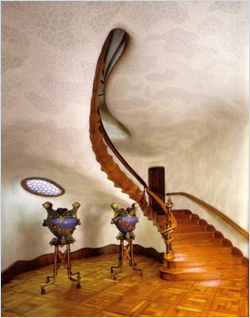 We find this Gaudi staircase to be a timeless stroke of brilliance! Just take a look at how this staircase penetrates the ceiling! We would like to introduce our latest restaurant project. 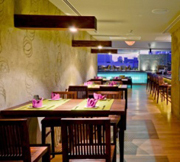 In November 2011, Leapfrog Restaurant and Bar was opened atop the new Ramada Encore Hotel in Bangkok. This project provided us with the unique challenge of creating a relaxing space that acts as poolside resort club for the hotel guests during the day and an elegant indoor/outdoor restaurant and lounge at night. We achieved this by combining a minimalist and flowing layout with down to earth materials of rough and raw concrete walls, rustic teak furniture and doors, and a gritty steel bar. We then added the desired “bling” by creating and installing a fabricated glass-walled swimming pool, glass bar shelves, and sculptural glass pedestal sinks in the restrooms. 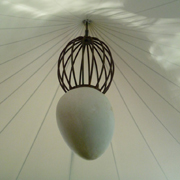 Another feature of the restaurant is our hand-crafted sculptural chandelier which hangs down from a high pitched canvas roof. Definitely not a store-bought fixture!!! We are currently at work in the studio on an upcoming collection of bronze and glass sinks which will be available through our website. 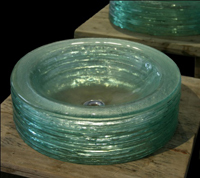 Below is a sneak preview of one of our glass sink designs. Stay tuned for details on this collection and more…..
Well, that’s all for now. We hope you enjoy viewing “Things We Love” and, as always, we welcome any comments or questions that you may have.